On April 16, the Youtube personality Dutchsinse posted a revealing video on numerous earthquakes that struck Southeast Asia, particularly in Kyushu, Japan. These quakes apparently caused a tectonic landslip of 3 feet of movement, and were also linked with the eruption of Mt. Aso. The damage was quite extensive in this region. However, the affected area stretched far beyond Southeast Asia. There have been quakes in Taiwan, New Zealand, numerous areas in the West Pacific, and other regions as well. These seismic events typically start as deep quakes, which then lead to shallower quakes in the same, or adjacent areas. Here is Dutchsinse's post from April 16. As we consider the possible causes of so many earthquakes occurring over such a short period of time, lets keep a few things in mind. There are many factors which cause earthquakes. By my understanding, tectonic movement is a result of the combination of geothermal, convexial currents, the Earth's adjustment to the sun's energetic output, as well as several man-made variables (such as fracking injection wells). Along with these mainstream explanations, there is the somewhat alternative theory that the Earth is expanding, and tectonic movement is the result of the solid crust adjusting itself over the growing, semi-liquid mantel. The cause of earthquakes could be any combination of the above factors. It may even be caused by each of them at various times. 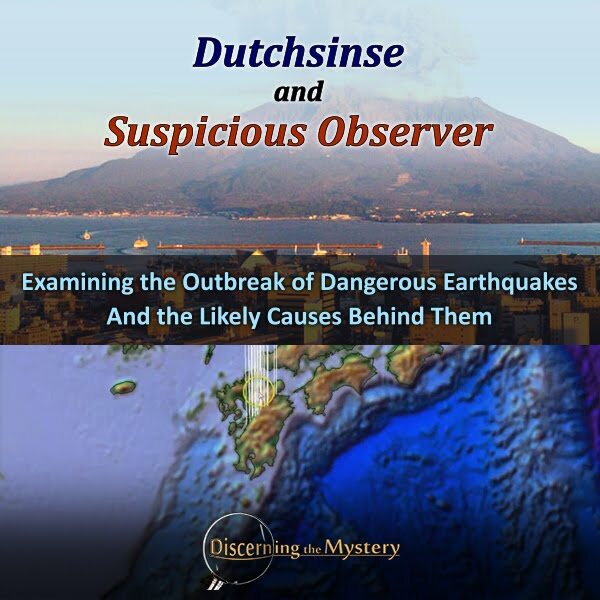 In light of the connection with solar flairs and CME's, lets take a look at the Youtube channel Suspicious Observer to see if solar activity from previous days may have contributed to this recent slew of quakes. As we see, there was notable solar activity right around the time-frame which may be attributed to the recent tectonic activity. As I understand the typical scenario, it is usually 2 to 3 days after significant solar activity that we see the Earth responding in some way to these solar events. Though we cannot say for sure, if this is the only possible cause, it seems to be a significant piece to the puzzle. On April 17, Dutchsinse posted a very interesting link on his Facebook page. This link referenced a Youtube video pointing to CERN as a possible cause of many of the earthquakes we have seen over the past two weeks. I am not familiar with this specific channel, but the video does present some very interesting information. Lets take a look. What I find particularly suspicious about this worldwide outbreak of earthquakes is the fact that only a few weeks ago, the USGS canceled vital reporting services in some of the most earthquake-prone areas in the world. It wasn't only that they canceled these services, but it was the fact that they did so quietly and without any major announcement to the public so as to provide ample time to divert their attention to other, more reliable reporting agencies. On top of this strangely irresponsible behavior from the USGS, one of the directors of this agency actually made harassing phone calls to Dutchsinse for simply reporting on tectonic activity which the agency refused to report themselves. One particular earthquake which Dutch accurately predicted happened right near Mt. St. Helens. This quake happened precisely where Dutch said it would, but instead of acknowledging the fact, the USGS teamed up with mainstream news agencies to harass him, and printed derogatory content and lies about him. These are professional scientific and news-reporting agencies taking time out of their busy schedules to slander a Youtube'er for nothing more than making accurate predictions. This lead me to believe that there was something they were trying to hide. Could it be that someone knew these quakes and eruptions were coming, and were told to stay quiet about them? Many of us have heard of the cult beliefs which likely govern the decisions of those in seats of power around the world. These people have proven themselves to be elitists who care little or nothing about the common people. They hoard resources, wealth, instigate world conflict, and cause countless problems for the common people because they believe themselves to be more entitled to the right to exist than those less fortunate. Many of these people believe in the concept of "order out of chaos". They believe that it is their job to create order by causing trouble, and that by causing mass suffering and death, they eliminate those who are week among the "herd", and ensure that only the strong survive and continue the human race. Why Are Thousands Of Millionaires Fleeing Chicago And Other Major Cities Around The World? The Georgia Guidestones - Illuminati Ten Commandments? These people believe that humans are bad for the Earth, and that there are too many of us to maintain a healthy, global ecosystem. (At the same time they deny the world the advanced technology which would solves this problem without mass death.) Thus they believe that population reduction is a suitable solution to this problem of overpopulation. This is not at all to say that these people are the sole cause of earthquakes worldwide, but it is to suggest that such a plan would be to their advantage, and it wouldn't surprise me if they had such a plan up their sleeve. I could definitely see them using devices such as HAARP or CERN to amplify the natural occurrences of earthquakes so that they become more destructive and cause more damage than they naturally would. This would explain why the mainstream, scientific stance constantly denies that it's possible to predict earthquakes when it obviously is possible, as Dutchsinse has proven for years now. It's likely that someone behind the scenes doesn't want anyone to know it is possible, and that they are already doing it. It is also possible that they denied the fact of HAARP's influence of weather and other planetary occurrences because they knew that that was also possible, and they didn't want the public to know. Moreover, it would not at all surprise me that they denied the possibility of groundwater contamination from poorly maintained fracking operations (which was most-likely the cause of groundwater contamination in places such as Crystal City, TX). It seems to me that these shady and suspicious denials point in one common direction. The latest scheme of this destructive, elitist cabal seems to be to cause and amplify tectonic activity. They likely want to cause damage from quakes and volcanic eruptions as another attempt to instigate mass death, but before anyone goes running for their bomb shelter, lets consider a few things. There is very little reason to actually worry about any such plan, as it is very unlikely to succeed. These people have been failing on countless levels at their attempts to reduce population via mass death, and I don't see this changing at all. In fact, it will most likely lead to their ultimate defeat. Any group who is actively attempting to cause three quarters of the population to die off is likely going to loose three fourths of their own numbers. The fact is that karma is real, and these people likely have a banquet feast of it waiting for them. A devious plan like this may seem far-fetched to some, but I see it as a strong possibility based upon the past behavior of these trouble-makers, and combined with this apparent, widespread refusal of American, monitoring agencies to report accurate seismic data, I would say it is likely. However, I think it very wise for each of us to realize that it is we who are calling the shots. No one actually has to consent to any of this. The point is not to give into fear of difficulty or potential danger (though ample preparation with food, water and supplies is always a good thing), but to envision and to create the world we desire to live in. Until we stand up to them, these people will continue to try and kills us, all while telling us to look the other way. When we demand full disclosure, and force their crooked deeds into the light, then we can have the safety, the resources, and the prosperity that we all desire. As far as when this all occurs, the choice is ours to make. I remember when Haiti earthquake happened. It was in 2010. Earthquakes occur causing the fault. The people didn't understand. The fault caused the earthquakes.